The Bedford Depot Building which is located at 80 Loomis Street is being made available by the town for rent by businesses. The Depot which was built in 1874, was used as a railroad station for the Boston & Maine Railroad which ran from Depot Park in Bedford to West Cambridge (AKA Alewife Station). The Bedford Depot Building was used by the railway until it was sold to a local electrician in the late 1950's. The electrician added a second story to the building and used it as storage and rented out the rest as office space. The Town of Bedford bought the Depot in 1999 as part of the Depot Park project and has continued to rent out the building as office space to existing tenants. The Depot has approximately 1200 square feet of space on each of it's two floors and 1000 square feet of storage space in the basement. The Bedford Depot was originally built in 1874 and was used as a railway station for passengers on both the Boston & Maine Railroad and the Billerica & Bedford Narrow Gauge Railroad. It included a ticket station and separate waiting areas for Men and Women. The last few years have seen a host of improvements to Depot Park. The Town got a Federal Grant to upgrade the Loomis Street and South Road Intersection with improved pedestrian access and installed benches, trash receptacles and a water fountain to the area. In addition, the Bedford Farmer's Market will be held across the street starting in June. The Bedford Depot Building still has the original train signals on the roof. I recently spoke with Jim Shea who is President of the non-profit Friends of Depot Park to learn more about the entire Depot Park project and why the Town decided to move forward with this Request For Proposal (RFP) to rent out The Bedford Depot Building. Jim explained that when the Minuteman Bikeway opened in 1993, the terminus in Bedford just ended in an unsafe manner right at South Road, there was not even a sign. Over the past 10 years or so, the Friends of Depot Park (who now number over 300) have worked closely with the town to improve the park and surrounding area to create a "Welcome to Bedford" positive feel in a previously neglected area of town. Jim mentioned that even with all the improvements, many users of the Bikeway still have no idea of where they are when they get to Depot Park. The Depot Building sits adjacent to the western end of the 11 mile Minuteman Bikeway. In the distance, you can make out Budd Rail Diesel Car #6211 which went into service in 1955 and is in the process of being cosmetically restored. According to Jim, an architectural study was done last year to look into the costs for a complete overhaul of the Bedford Depot to bring it back to it's original state (including removing the second floor). The results of the study indicated that the total cost would be close to $1 million dollars which is beyond the current financial capabilities of the town. The Bedford Depot is in need of a renovation. While a complete renovation is not in the immediate future, a new roof is scheduled to be put on this summer. There are about a dozen parking spaces in front of the building with a total of 116 spaces available in nearby free public parking. Due to this cost, the Town decided to explore if any businesses would be interested in renovating the building and came up with the RFP. Jim explained that if a tenant would like the entire building, the town would entertain a long term lease at a low price if the tenant was interested in doing the renovation in accordance with the town and historic guidelines. While that would be the ultimate solution, the town is also interested in just attracting businesses that would help turn Depot Park into a destination while generating lease revenue, which would go to supporting the park. As part of this process, the Town recognized that many businesses would be interested in a lease beyond the 5 year maximum allowed under state law. So the Town has added an Article for Town Meeting which if approved, would extend the maximum lease term to 10 years and provide the option to extend it all the way up to 99 years with authorization of the state legislators. Over the next few months, the Town will appoint a committee to evaluate any proposals that were submitted by the March 24th deadline. The proposals will first be ranked on a subjective level and then they will be looked at in terms of pricing. In the subjective review, the RFP indicated the Town will provide a "Highly Advantageous" rating to businesses who want to rent the entire space for a restaurant, education, philanthropic or business/professional office. The Town has flexibility in renting to multiple businesses and will allow interior alterations with Town approval. State money has recently been appropriated for the renovation of the nearby Bedford Freight House which is scheduled to begin shortly. The renovation will be a complete overhaul and include some badly needed public bathrooms. In addition, a kiosk will be setup in front of the Freight House and will display a map of Bedford along with some local points of interests. In talking with Bedford residents, the most preferred business seems to be a restaurant in the Depot featuring outdoor seating overlooking Depot Park and the Minuteman Bikeway. In fact as part of the architectural study, a basic floor plan was commissioned and came up with the design below. 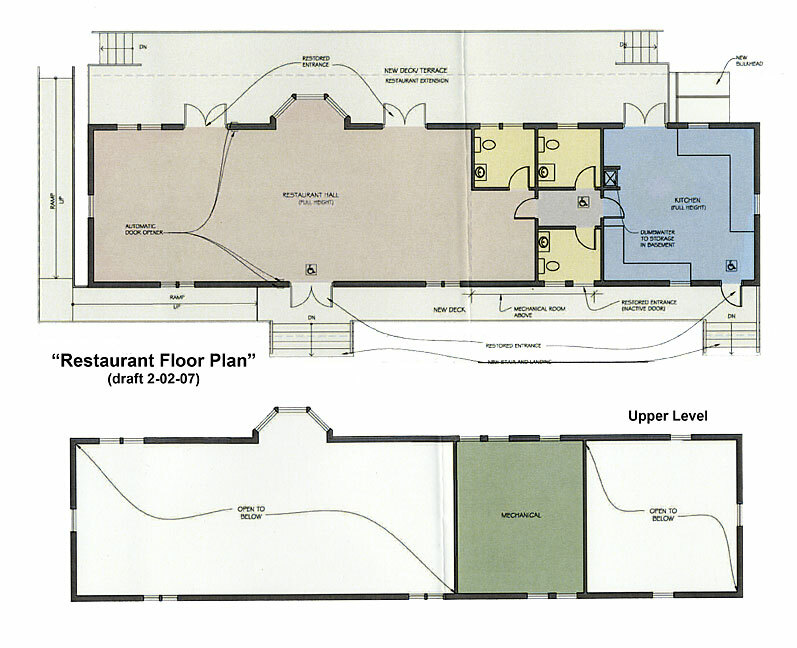 Draft design of a Restaurant Floor Plan for the Bedford Depot. Notice the deck that wraps around the building with a patio for outdoor seating. Please click on this image for a larger view. I think a restaurant in Bedford Depot would be a great addition to Depot Park and would add to the atmosphere of the Depot Park area and provide a destination point for the Minuteman Bikeway. I also think it would be helpful to visitors for the new Kiosk in front of the Freight House to include local businesses especially restaurants which should pick up some extra business from the Bikeway. Perhaps some basic advertising could be sold on the Kiosk with the money going to maintenance of Depot Park. The current rear view of The Bedford Depot Building. A restaurant could include outdoor seating that looked over the Minuteman Bikeway. After being closed for just over 100 days, The Bedford McDonald's has reopened in the same location with a brand new building. As previously reported, the building and site have been totally redone. While I have not yet been inside the new McDonald's during lunchtime, I have noticed a few of the nearby restaurants are now less crowded. For the rest of March, The Bedford McDonalds is offering many daily specials like 99 cents all you can eat hot cakes as well as a chance to win a few prizes. Click here for more details on these specials. Below are a few pictures highlighting the changes. Remember you can click on any of the pictures for more details. The Interior has been modernized. This is the new "Linger Zone" designed for lounging similar to Starbucks and includes more comfortable seats, a fireplace and plasma televisions. This is the "Grab and Go Zone". It was designed for people who want to grab a quick bite and also for people who are eating alone. It makes uses of taller seats similar to a bar stool. This is the new McCafe Coffee Bar. Built to compete with Starbucks and Dunkin' Donuts, you can order gourmet cappuccino, espresso, lattes and iced mochas. Everything is made to order. Here is the new dual lane drive-thru. There are two lanes for ordering which then merge in to one lane for payment and food pickup. This new configuration is supposed to reduce waiting times during the busy lunch rush. Hopefully it will eliminate having traffic back up on to Great Road like it did with the old single lane drive thru. You can no longer exit back on to Great Road. All exiting cars are routed around to the back on to Shawnsheen. A sidewalk has been added from Shawnsheen to the front entrance. You still need to keep an eye on cars exiting the drive thru. The "Official Ribbon Cutting" ceremony. Pictured L-R are: Steve Swanson, Field Service Manager for McDonald's, Teresa Degou, Manager of the Bedford McDonald's, Tim Moulton, Director of Operations for McDonald's, Bob Hogan, owner of the Bedford McDonald's, Erin McCormack, VP of the Bedford Middle School Parents Association and Ron Maloof, Area Supervisor for McDonald's. Later on, a check from the Bedford McDonald's was presented to the Bedford Middle School Parents Association.